As a parent, I feel that the best way to teach my children about social responsibility is to demonstrate it myself. That means through actions and words. So we talk about issues like helping others who are less fortunate, learn about things we don't understand, and do our small part to make our home, town, country, and world a better place. 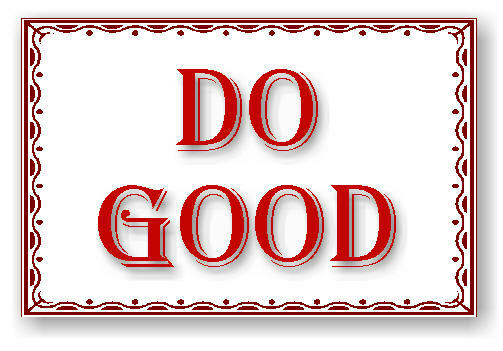 I think that as a blogger, I am doubly obligated to focus on social good. I have a platform that is perfect for teaching and helping others. In my experience, the written word can so often prove to be a powerful motivator. And I think all bloggers should use their sites to "pay it forward," so to speak. If we have the ears (eyes) of others, we should use the opportunity to help make our own little niche a better place and a source of inspiration. Obviously I am passionate about education, and from time to time, I want to write and share articles that promote social responsibility and The Golden Rule. Laurita's article yesterday, was just one example of how I want to be able to share knowledge and express support. I hope that you took a moment to learn about spina bifida so that the next time you meet someone who is affected by this condition, you can interact with them in a knowledgeable and compassionate manner. I believe that social media and mobile technology are powerful tools for spreading awareness and doing good. Over the next few months, I'm looking forward to sharing more articles on MommyMaestra on other organizations and programs that focus on health and education. And if you follow my Facebook page, you've already seen me sharing articles and resources on these subjects and others. What do you think? Should bloggers and other social media professionals use their platforms in a socially responsible way? Disclaimer: I was compensated for writing this article, which was written in conjunction with the LATISM Social Good Goes Mobile Blog Tour. Mommy Maestra, I love your post. You are doing a great job, teaching your children what social responsibility is about. I totally agree with you: bloggers and social media pros should work together in a more responsible way. Hola! I also love your post. If we are socially responsible outside the social media world we should bring into our blogs. I would be honored if my words can help somebody. I think that if we have an opportunity to share information or help another blogger then we should. Agree 100%. In addition to using the platform to promote ourselves, businesses and corporations we should also be using this platform to help nonprofits spread their message. Kudos to you for writing this and reminding us all. Absolutely!! And you are doing an amazing job! Absolutey right, I feel exactly the same! great post! A must read article for everyone and anyone. Yes, all the way around. Agree 100%! Just had someone write an article that included information about me that was false. Author didn't even bother to check to very facts! What kind of responsibility is that? I think it's important to do social good but I also believe some bloggers just love to write and create and entertain without a social or political message, it all depends what the blogger/writers passion is. I much rather be true to my craft and vision. Great post!! I think bloggers are generally giving people, they give their passion, support and voice. You Know What We Did This Weekend, No? Will All the Teachers Please Raise Their Hands?